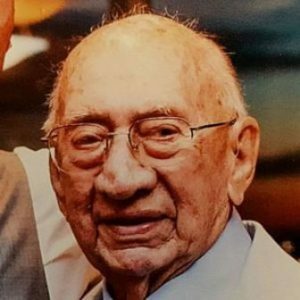 Marlborough – Robert F. Dufault, 92, of Marlborough, died Feb. 5, 2019 surrounded by his family, after a brief illness. He had been married to the love of his life, Josie A. (Fiorentino) Dufault, for the past 64 years. Born in Marlborough, he was the son of the late Frederick and Aurora (Allard) Dufault. Robert is survived by his children, Michelle Turner of Plymouth, Linda Freitas and her husband Michael of Westborough, Nancy Casaceli and her husband Michael of Marlborough, and Debra Dufault McIntire and her husband David of Southborough; his grandchildren, Bryan, Kyle, Lindsay, Jaclyn, Anna, Chandler, Luke and Kevin; and great-grandchildren, Mason, Wyatt, Sonsie, Morgan, and Natalie. He also leaves his sister, Estelle O’Connell; sister-in-law Mary Zambito and husband Charlie; and many, many nieces and nephews. He was predeceased by his beloved oldest daughter, Denise Mitchell, and his sisters, Anita Brodeur, Doris Gebhart and Jeanne Collins Hawkesworth. Bob, a veteran of WWII, served in the U.S. Navy from 1944–1946. He was employed by the MDC, retiring in 1989. He immensely enjoyed spending time with his family and friends, and spent many years wintering in Palm Coast, Fla. Bob enjoyed playing sports, and played semi-pro baseball as a young man and golf in his retirement. He watched and supported all his Boston teams and loved attending his grandchildren’s sporting events. Bob always told a great story of his life’s adventures and put a smile on everyone’s face. He was known for his pizzelles and Saturday morning breakfast. Bob will be greatly missed by all who had the pleasure of his company, especially his family. Visiting hours will be held Sunday, Feb. 10, from 2-4 p.m., at the Slattery Funeral Home, Inc., 40 Pleasant St., Marlborough. A funeral Mass will be celebrated Monday, Feb. 11, at 10 a.m., at St. Bernadette Church, Main Street (Route 20), Northborough. Burial will follow at St. Mary’s Cemetery, Beach Street, Marlborough. In lieu of flowers, donations may be made in Robert’s name to St. Jude’s Children’s Hospital, 262 Danny Thomas Place, Memphis, TN 38105.